This article was written by Andrew Walsh that I edited. Andrew is a grad student of mine at the Rutgers School of Social Work. This is the third article that he wrote under my guidance this year (his first piece was on addiction hotlines and his second one on Medicaid in NJ was published last month). Older adults have significant physiological differences than younger adults that increase their sensitivity to alcohol and drugs. As individuals age, they start to lose lean body mass and water which both decrease metabolism. With slowing metabolic rates, the body’s ability to metabolize alcohol and drugs slows, thereby accumulating in fat stores in the body. Prescription use is very common among older adults. 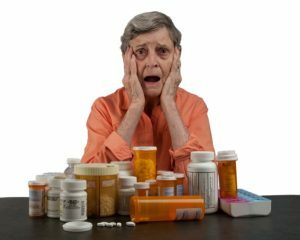 A survey on women over the age of 65 showed that 94% took at least one medication daily, and 57% took five+ medications daily. The same survey showed similar rates among men. Cognitive decline is often associated with aging and can interfere with older adults’ ability to monitor their intake of alcohol and drugs and compliance with their prescriptions. Older adult substance abusers can be broken down into two distinct groups. One group is comprised of substance abusers who had early-onset substance abuse prior to the age of 60. This group of early-onset substance abusers is typically male and is medically compromised after years of substance abuse. The later-onset substance abuser-group is mostly comprised of women and is less compromised medically due to their short exposure to the harmful effects of substance abuse. Later-onset substance abusers typically start abusing alcohol and drugs following stressful life events such as the death of a partner or friends, retirement, changes in loving situations, and declining physical health. Pharmacology is used extensively with substance abusers for abstinence purposes. However, the physiological condition of older adults prevents the use of pharmacologic treatments for substance abuse. The medications for alcohol abuse put seniors at risk for dehydration as well as cardiovascular issues. There are opioid blocker medications that are effective in reducing the pleasurable effects and craving of opioids. However, the blocking agents also prevent the relief of pain, which is common and usually chronic with older adults. In New Jersey, the government is pursuing a number of actions to actively combat substance abuse among the elderly. Governor Christie pushed for legislation that limits the initial prescription of opioids for acute pain to five days. New Jersey has also joined the prescription monitoring program (NJPMP). This system allows doctors to access patient prescription records for the previous two years, thereby decreasing the frequency of doctor shopping. From 2014 to 2016, New Jersey opioid prescriptions decreased 11% while physicians use for patient searches increased from 1.4 million in 2014 to 2.5 million in 2016. Governor Christie has also called for an additional 864 beds for inpatient substance abuse treatment. However, at this time none of these beds are earmarked for Medicare recipients. The NJ Department of Health and Human Services provides educational seminars to seniors about medication management and substance abuse. In 2015, 154 presentations were attended by approximately 3,300 seniors. Individuals who abuse alcohol and drugs typically experience withdrawal when they stop using. For older adults who are already in a medically compromised physical state, withdrawal places significant stress on an already stressed body. Withdrawal in older adults places significant stress on the respiratory and cardiovascular systems. The safest treatment option for older adult substance abusers is that they use a medically monitored withdrawal management process. However, according to the New Jersey Connect for Recovery hotline, there are only six facilities in New Jersey that accept Medicare for in-patient detox. The facilities that accept Medicare are Princeton House, Core Health, Summit Oaks, Bergen Regional, and St. Clare’s. Combined these facilities have approximately 200 beds that are available for Medicare recipients for withdrawal management. With the average withdrawal management stay being seven days for older adults, 10,000 older adults will be able to receive substance abuse treatment on an in-patient basis in New Jersey. This means 1 in 20 older adults who need in-patient detox will actually receive it. However, not all beds available for Medicare recipients are actually earmarked specifically as only for Medicare recipients. Bergen Regional accepts clients Medicare, Medicaid, and those with no insurance. Princeton House and St. Clare’s accept clients with Medicare, Medicaid, and private insurance. Summit Oaks and Core Health accept those with Medicare and private insurance. This decreases the number of beds available for Medicare detox to approximately 100 beds. This means that 1 in 30 older adults who need in-patient detox will actually receive it. Even if all of these changes are implemented, the overall number of seniors who are substance abusers most likely increase as more baby boomers turn 65. The actions described above are meant to produce sustainable decreases over time. As more baby boomers retire and start to decline physically and cognitively, coupled with an utter lack of senior specific services, substance abuse among baby boomers is likely to get much worse. Even if all of these changes are implemented, the design of Medicare reimbursement for doctors on a fee for service basis encourages doctors to spend less time with patients. Unless this aspect of the Medicare system is redesigned, no sustainable progress can be made among seniors with substance abuse problems. A tremendous amount of work needs to be done if there is to be any improvement in substance abuse among seniors. Andrew Walsh, MHRM, MSW Intern is currently pursuing his MSW and LCADC at Rutgers University. Prior to returning to Rutgers, he worked in the Gulf of Mexico oilfield as an internal business consultant. Andrew is a lover of books, cuisine, and theater.